In my garden, April starts the new year. I feel like an April Fool often enough that is is not a bad start to the season. What really makes me think of new year's, though, is how much April tells about the previous year. All my mistakes are in front of me. I can make resolutions and plans before I forget what I did and why it worked--or didn't. The cover crops I didn't plant in time, the beans I ran out of in March, the greens I'm tired of or the salads I love. That fantastic squash that has kept since October. I'm learning that no, I actually won't remember it all later. Got to take a long look and write it down. Spring has come to our riverbank. The river still roars, but it's going down. 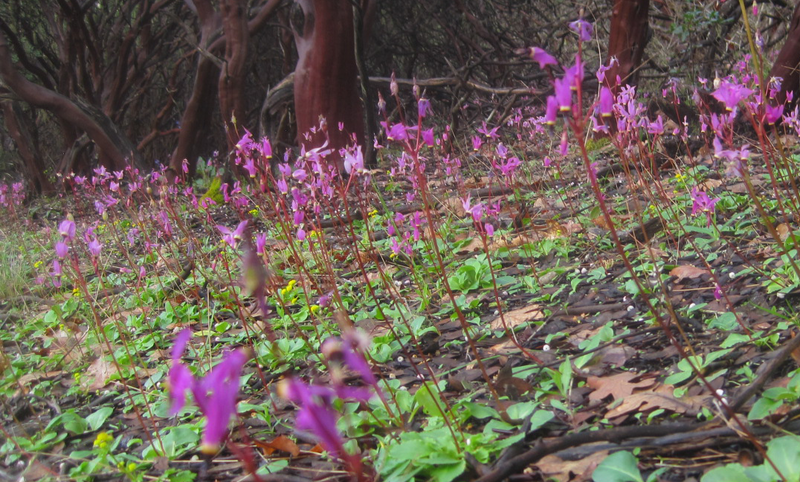 Shooting-Stars and Baby-Blue-Eyes are blooming in the woods and meadows. We'll collect their seeds, for planting with the fall rains. Greens bring their wild flavors to the table: miner's lettuce, chicory, corn salad, cress, sorrel, sylvetta, dandelions. The rain makes them lush. Rain is something we've had lots of. Actually, rain is pretty much all we have had. The garden is ankle-deep in places, and squelches everywhere. In high spots, my peas--planted in February--are finally 6 inches tall. Little lettuce seedlings are just big enough to recognize in the garden beds. (No problem recognizing the weeds, which are at least 10 times bigger.) In the greenhouse, tomatoes and peppers sit in their pots, reaching for the sun and hoping for a lot more warmth than they are getting right now. We are still eating the overwintered brassicas in the garden. Rapini (green flower stalks) from overwintered turnips and kale are an easy, prolific, and zesty alternative to broccoli. We love them steamed and served cold with olive oil and lemon, or added to pasta. Mustard greens, dragon's tongue. Green onions, chives, sorrel, lettuce, arugula, cilantro. It is good to stop and think right now, during the "Hunger Gap" before this year's garden has produced new food. What should I have done differently? Why did the gophers get all the potatoes? 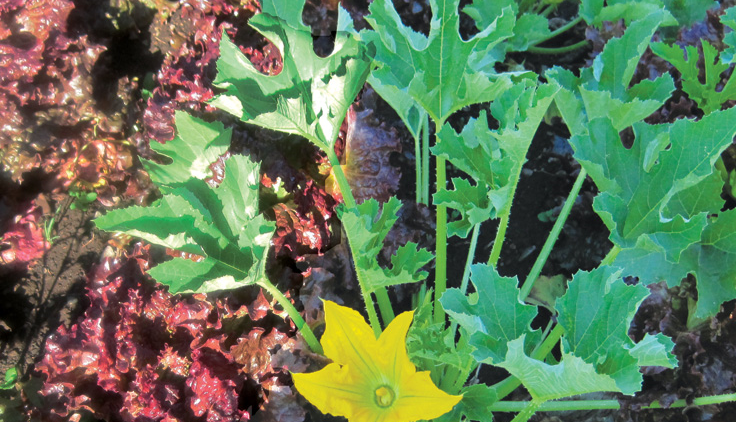 Why didn't I plant endive as a change from kale? April is the test of the homestead garden. Is there food? What don't you have to eat that you could have? Myself, I am wishing I'd planted more parsnips, carrots and beets--those sweet comforting roots. Next year, I promise myself. Next year I need to start more things in July and August. Since I seldom actually do, I'm thinking I'll start more perennial vegetables now. This is when perennials shine; they send up sprouts and make food before this year's sowings can get to edible size. I've been eating sorrel, green onions, and sylvetta since February. Miner's lettuce and Erba Stella too. Did you know that hops send up edible shoots in spring? Why don't I have those? I'm planting Caucasus Spinach, rhubarb and asparagus, more sorrel, more green onions, and perpetual leeks. Perpetual Spinach is one of my favorites, so versatile, and resistant to both heat and cold. I have set aside a new bed for perennials. All they need is an new layer of mulch every year. At least I'll have spring greens covered. Just sowing some root crops for fall will be easy. Once the last frost is past, a different kind of magic is in play. The three sisters transform the garden--dignified corn; beans racing skyward in spirals, boisterous squash sprawling and romping over the ground. Suddenly things happen overnight. Sunflowers! Tomatoes! Zinnias! It's all primary colors and bold strokes. Watercolors give way to crayons. Delicacy gives way to exuberance. I love both. At this point in the year, I can get in the car and drive to summer. Just a little further south, a little lower elevation. (find your last frost date here.) If that's where you live, you can start summer planting with sunflowers and quinoa, the early birds. Then beans and squash. Leave things like melons and okra (and setting out peppers) til it gets hot. Here, where it's still pea-planting time, I'll be waiting for the river to go down. Onions. One of the great frustrations of gardening. You plant seeds and they turn out puny. You plant sets and they bolt to flower or rot or something. Not worth it, people say. Onion bulbs aren't roots. They are bundles of swollen leaves. You always hear that rich soil, manure, nitrogen, etc isn't good for root crops like carrots or beets. Remember that onions aren't roots. Look closely at the photo. The bulb is made from the bases of the leaves. So, think of them as a leafy green and fertilize accordingly. 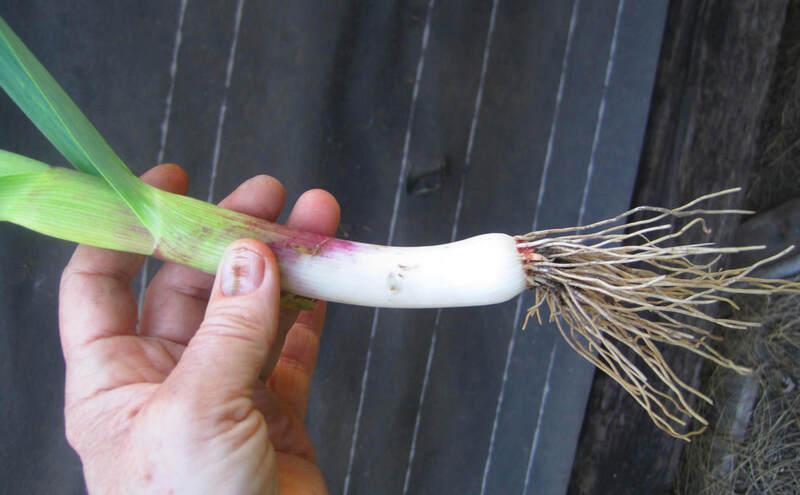 I've seen even very experienced gardeners starve their onions (and potatoes, too) because of the word "root". Bulbs and tubers LOVE nitrogen. An onion grows and makes leaves until the day length reaches a certain number of hours. Then, it stops making leaves. The existing leaves start to swell up. The bottom of each leaf eventually swells so much it becomes a ring of the onion. Each onion variety has a specific number of daylight hours that will cue this process. So, if you sow onion seed now, it has time to make a big plant before the days get long. It can make lots of leaves. Lots of leaves = lots of onion rings. If you start them later, they will be still small when the magic date arrives. And, if the soil gets really warm before they get those long days, they will forget bulbing entirely and make a flower instead. Short-day varieties, start to bulb when they get 10-12 hours of sunlight. For intermediates it's 12-15, for long-day varieties it's 14-16 hours of light per day. The line between short and long day varieties runs from Washington DC to San Francisco, with intermediate areas being close to that line. Grains like Wheat and Barley are day-length-sensitive too. The plants will grow bigger and make more leaves and stems while the days are short. As the days lengthen, the plants get ready to bloom and then to mature seeds (grain). Harvest is just after the longest days of the year. Do you have to understand all this? No. Just understand that you need to start onions now. They can be indoors or in a greenhouse, but they need soil that is 60 degrees or so. They are little bitty things for the first couple of months, so if you sow a couple of pots with onion seed, about 1/2" apart in the pots, you can add them to your tomato and pepper starts without much trouble. Grains should be started directly in the garden--they love cold mud--as soon as the soil can be worked and planted. I suggest growing a backyard plot of grain. Not just because it isn't modern "bad for you" wheat, but because it is easy, fun and delicious. You don't have to go all the way back to wild grasses and very ancient grains like einkorn (they are difficult to de-hull for eating.) 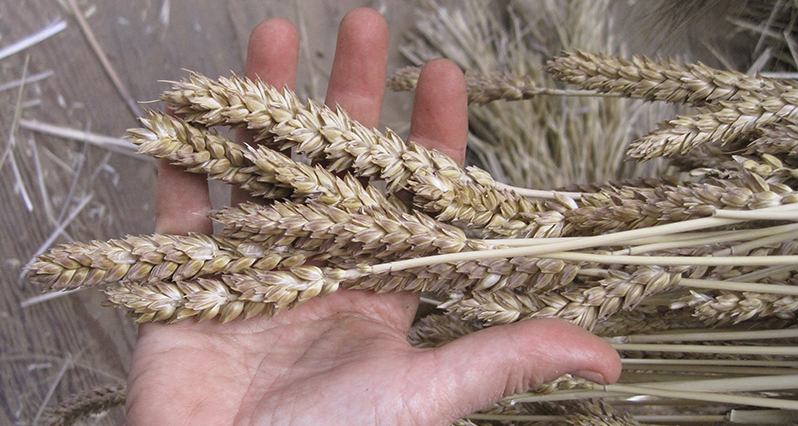 There are many wheats and barleys from before modern "green revolution" grains were the norm. Generations of farmers raised big healthy families on these heritage grains. The hulless barleys make wonderful pilaf, cooked like rice. You don't even need a grinder to do that. Barley is a very fast-growing spring grain--the main cereal grain in the Himalayas, where seasons are too short for other grains. So you can harvest your barley and still have the space for something else for most of the summer. Foodies are discovering that old wheat varieties like Red Fife, White Sonoran, and Maris Wigeon have a sweeter, more buttery flavor than modern wheat. Several bakers have commented that they taste like there is honey in the dough, when they is just water, flour, and salt. They are easy to grow and easily prepared for baking. A growing number of gardeners bake bread, tortillas, biscuits, pie, and cookies, from their own heritage wheat. Here is a pie recipe and here is a bread recipe for White Sonoran wheat. You can also find recipes that show off the flavor of Red Fife and other heritage wheats. There are a lot of ancient and heritage wheat and barley varieties that can adapt to either spring or fall planting. These varieties (called facultative grains) can figure out for themselves that it is time to go to seed, whether they got winter or not. Red Fife, Einkorn, and others have this ability. Barley breeders are already working on finding facultative barleys. Perhaps modern wheat breeders will rediscover the survival advantages of flexible traits like this. We know such flexibility was critical to the survival of generations of subsistence farmers--our ancestors. They left us a legacy of heritage grains. You can see some of them here. Lately I've been thinking about where our seeds come from, and the stories they bring with them. When you plant them, those stories from the past shape the future too. Every seed tells a story. GMO seeds tell a story about laboratories and big money. Many F-1 hybrids tell a story of proprietary inbred lines, trade secrets and induced sterility. But there are encouraging stories too. There are the stories of heirloom seeds. Some brought from Italy, China, Ireland, Africa. Some grown as sacred foods on our continent for thousands of years. Some shaped in our own farms, towns and cities by gardeners and farmers saving their own seeds. Heroes like Will Bonsall have collected thousands of traditional heirlooms to save and carry on. I carry lots of these, and try to pass on their stories if I know them. Our "Heirlooms and Their Stories Collection" has seeds from my neighborhood, along with a couple of pages telling their stories. But not all wonderful stories are old, historic ones. When asked why he didn't patent his famous plant introductions, University of New Hampshire professor Elwyn Meader said "I was working for the taxpayer and the results of my work belonged to them." Today, seed corporations, and even universities, are using patents and GMOs to keep their work locked away from the public. But some public-domain breeders like Jim Myers at OSU have stood firm. You can read the story of how Monsanto's Seminis Seed Corp tried to steal Myers' work HERE. It's both an outrage and an inspiration. From the 19th century to the present, our land-grant universities, and small seed growers have given us a diverse heritage of public domain, open-pollinated seed that continues today. 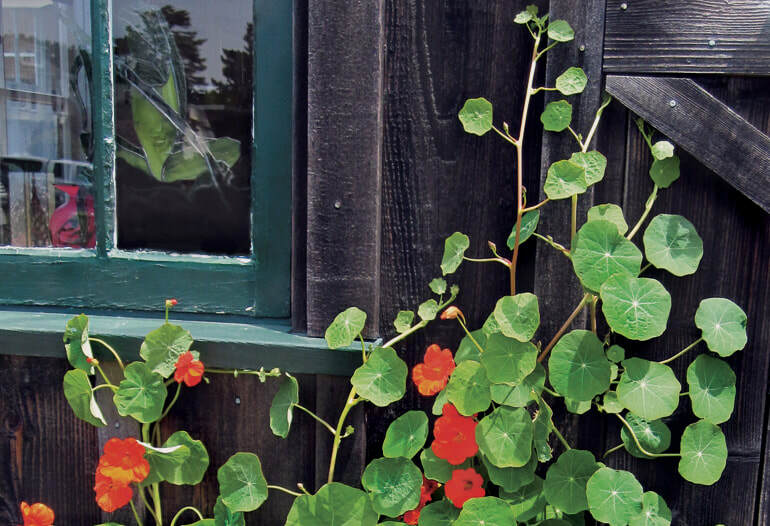 If you have grown Oregon Sugar Pod Pea, Waltham Butternut Squash, Grand Rapids Lettuce, Provider Bean, Rutgers Tomato, Clemson Okra, you have harvested the legacy of Jim Baggett, Robert Young, Albert Yeager, and other great public-domain breeders. They believed that improving food plants was a service to humanity, and they were right. Since 2012, we have a new set of public-domain heros who have voluntarily given up their patent rights as part of the Open Source Seed Initiative. People like Carol Deppe, Frank Morton, Jonathan Spero, and David Podoll are outstanding breeders, and could have made money patenting their work. Instead, they put their varieties in the public domain, for others to save seed and continue to improve. Quail Seeds carries 21 OSSI varieties. This means that, as with open-source software, not only the pledged variety, but all varieties bred from it are protected from patenting. The seeds and their progeny are in the public domain forever. This is what makes crop improvement possible. The full range of our genetic heritage is essential to safeguard our food supply from drought, disease, and other challenges. In 1970, blight wiped out most of the US corn crop. It was able to reduce millions of acres to slimy rubble because 43% of all US corn was grown from just 6 parent lines, all of which were genetically vulnerable. Luckily, plant patenting didn't exist in 1970. Breeders had access to other corns that did have resistance.